In these recent years, there are proposed many products and goods with "comfort" as their theme. Perhaps, it is due to the terrible social situation, represented by restructure and failure of many firms. "WILL Vi" is the very type symbolizing such mood of the contemporary days. 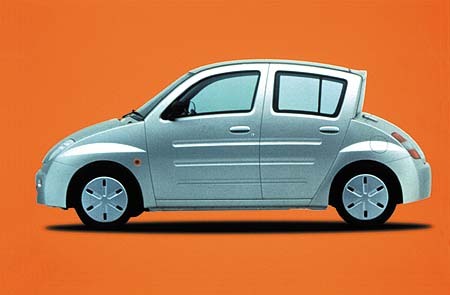 The design somewhat resembles classic French car, yet, it is rather futuristic and clean in its form. The round body just like a cup and the cliff cut rear window are the most unique kind quite unseen in ordinary cars. Its interior is exquisitely designed likewise a residential space. This car is not just a machine or transportation system but a cute pet for the user and makes others smile. The essence of this car is, indeed, its superb design.